Participants learned about the Saving Burdur Lake Project, and visited the site by boat to see the extent of the issue. They also visited pilot agriculture sites in Karakent village where farmers, with the assistance of Doğa Derneği, use advanced water saving methodologies (such as drip irrigation). 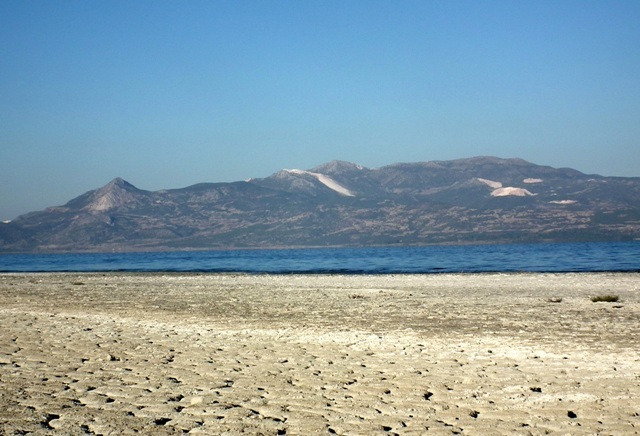 Lake Burdur, facing serious water loss mainly due to the construction of dams on tributaries for irrigation. During the meeting (held in Mehmet Akif Ersoy University Convention and Exhibition Centre), representatives from ten countries (Armenia, France, Greece, Islamic Republic of Iran, Iraq, Israel, Jordan, Kazakhstan, Kenya and Turkey), from NGOs, scientific institutions and UNDP country offices shared knowledge and experience on the reasons and results of drying of lakes, as well as on worldwide and regional action to save and restore drying lakes. Participants also discussed future collaboration and decided to establish a network to exchange information and experiences on the issue of drying lakes. The network will be open to activists, academics and public officials from Central Asia, Africa, the Middle East and the Balkans. Representatives from NGOs, scientific institutions and UNDP country offices met at the Conference.